Neck/scapula pain wont go away? Extend the use of your Pro Ice scapula/cervical collar (PI 100) with an additional ice insert (PI 101). Simply ice for an hour and replace the insert for another hour's use. 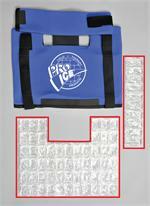 For nagging neck pain, extend the use of your Pro Ice neck cold therapy wrap (PI 120) with this additional ice insert. For shoulder/elbow pain that wont subside, add another Pro Ice cold therapy insert to your order and double the relief. Fits adult shoulder/elbow wrap (PI 200). Also a great way to stay at the top of the game during a tournament. Keep in the game longer, or be ready for the next match-up with the Pro Ice cold therapy additional ice insert. It doubles the length of icing available without refreezing. Fits pro shoulder/elbow wrap (PI 240). For shoulder pain that just wont go away, double the length of available icing time with an additional insert for the Pro Ice shoulder wrap (PI 260). Perfect for shoulder pain post surgery or with a nagging injury. Extend the usefulness of the Pro Ice cold therapy wrist wrap (PI 300) with an additional ice insert. This is perfect for nagging injuries or painful carpal tunnel issues. It also helps alleviate pain after wrist surgery. Extend pain relief with this additional ice insert, which fits any multipurpose model (PI 400). Doubles pain relief for shin, quad, hamstring, hip, lower back or knee. This is perfect for acute injuries or chronic pain to just about any part of the body. Already, the Pro Ice Knee Cold Wrap (PI 420) contains a double layer of ice to extend the pain relief. For some, however, that might not be enough. Add flexibility by purchasing an additional ice insert (PI 421) to lengthen the icing effectiveness. Nagging ankle injury that just wont stop hurting? Pro Ice Cold Therapy Ankle Wrap (PI 500 ) can certainly help to ease the pain and help the body heal. But for extreme pain or a serious injury, extend the icing ability with an additional ice insert. The lower lumbar back wrap (PI 720) already provides back pain relief for an hour, but for some with a serious back problem, that may not be enough. When back pain just wont go away, extend the relief with an additional ice insert (PI 721). The lower lumbar back wrap (PI 740) already provides back pain relief for an hour, but for some with a serious back problem, that may not be enough. When back pain just wont go away, extend the relief with an additional ice insert (PI 741).